NEW! Available in October 2015! For many years, Benedictine nun Joan Chittister wrote regular reflections on the psalms for her community, seeing them as a lexicon of the human condition. This book offers the best of those reflections that speak to the basics of human life on earth. 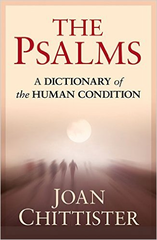 Organized alphabetically by quality, each reflection speaks to one particular psalm that is reprinted in the book and beautifully accompanied by photos and illustrations.